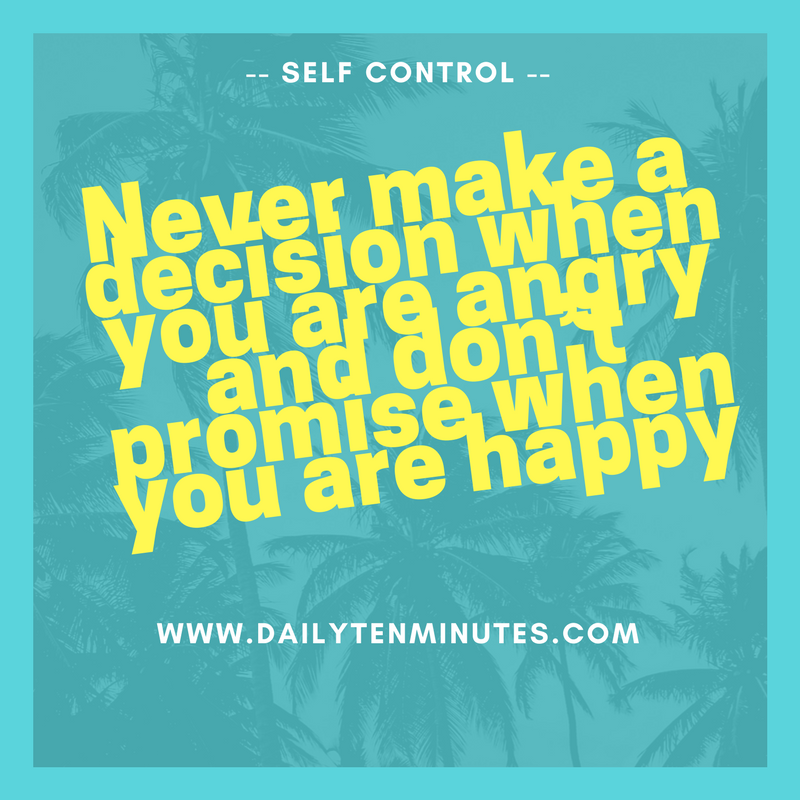 9 Effective Self-Control Tips to Help You Overcome Anger! - Something New Everyday! Home Stress 9 Effective Self-Control Tips to Help You Overcome Anger! 9 Effective Self-Control Tips to Help You Overcome Anger! Mark Twain once said, "Anger is an acid that can do more harm to the vessel in which it is stored than to anything on which it is poured." It is difficult to control anger, which often resembles a volcano that can erupt at any moment, grabbing hold of us in one second of inattention and taking over us until it is too late. However, the good news is that if you know the following methods and tips for dealing with anger, you can help yourself and your children understand this feeling better and discover ways to control it. Apply these ideas in your life and you’ll soon discover how relaxed you can be and how much control you’ll suddenly have over your life. The method of finger drumming is an emotional release method developed in the 1980s based on references in Chinese medicine to "release energy flow in the body." This healing tool helps reduce reactions to strong emotions and manage life with calm and ease. The original process involves regular drumming of the fingers while saying a particular mantra, but the simple version of this method is equally effective and can work even for children if you teach them how to use it. Whenever you feel emotional stress, drum your index and middle finger on your collarbone until you feel calmer. If you do this as soon as the nerves start and gradually slow yourself down, you’ll find yourself relaxing. You don’t have to do it in front of other people if you don’t want to, just go to another room for a few minutes and use this method until you calm down. We all think of the heart as the center of the body, but in fact, the center of the body is in the navel, to which you can focus all your thoughts instead of placing them on the person in front of you. This method can also be taught to children and it works very well. All you have to do is flex your stomach muscles and try to hold your navel to your spine. If you have done yoga or Pilates before, you already know this movement. This exercise calms and strengthens, it provides a strong sense of control and the chances of your anger erupting will decrease significantly. It is recommended to close your eyes when using this method because when you open them back up you’ll be able to feel the calm and control consciously and clearly. Most of us know what causes us to be upset, and if there are certain situations in which you already know you’ll give in to your nerves, it is recommended that you set yourself up to deal with anger in a specific way. If, for example, you know that you react angrily when someone else yells at you, you can get yourself used to explaining your feelings or behavior calmly without forming an emotional response if you say something "when you shout at me you hurt me very much" or “It makes me angry. " You can even say this to yourself because it is important that you identify your anger problem and the emotions that pop up in you. If you recognize the emotion once it is created, help yourself control it and prevent situations that will worsen if you give in to it. Anger accumulates when we are frustrated, but if you take a step back and wait 5 minutes, you can often realize how ridiculous it is to get upset about the situation - not always, but very often. Before you explode, wait a moment and see if there is anything that might seem silly and funny about what’s annoying you. For example, I once attended a meeting very early in the morning, which dealt with canceling me and my colleagues’ overtime. The fact that we were expected to spend extra hours in the morning to talk about canceling overtime did irritate me at first, but when I understood the amusing part of it I could joke with my co-workers instead of talking about how frustrating the situation was. We experience anger and frustration almost daily, and the more we experience these feelings, the more they become a routine part of our lives that dictate our actions. When you commit to practicing relaxation on a daily basis, you contradict those feelings of anger and frustration and incorporate positive rather than negative elements into your life. It isn’t difficult and doesn’t require any special effort, all you have to do is incorporate calmness in your life more often than anger. Spend a few small moments each day doing something that calms you down knowing you're doing a relaxing activity. If you want to be more careful, count all the times you were annoyed throughout the day and make sure that the next day you do the same number of soothing things. If you do this even for one month, you’ll already feel the change. There is a Monty Python sketch, in which Michael Palin pays for an argument in the argument room. We often do the same thing when, instead of using the money, we seek arguments by trying to push our opinions on people who don’t want to hear them. Whenever you feel you are about to enter this “argument room," ask yourself whether it really is worth it. When my father grumbled and complained about something I had done when I was a child, I would have mostly given in to the unnecessary argument because I didn’t want to go into this room with him. I knew that after the argument the two of us would be angrier than we had been when we entered. Therefore, you too should learn to identify these situations and avoid them, because usually, nothing comes out of them as long as the other party isn’t open to an actual discussion. You can go back and discuss the subject after a while when both sides have calmed down. If you feel you are about to lose control of your anger, you may just need support, and you can accept it even without asking for help from another person. Lean on a tree or wall, or sit on the floor. Connecting to the ground or any other contact that supports your body helps you feel physically and mentally supported, relaxed and stable. It is a strategy that helps you break away from strong feelings and gives you control over them. You can make this practice more expedient if you keep a small rock in your pocket and play with it whenever you feel you are in a state of turmoil. Feel the texture of the stone, notice its temperature and examine its weight. These actions help you focus on the physical reality and stabilize your emotions. One of the things that inflates our anger to exaggerated levels are fights and yelling, often resulting from misunderstandings. If you feel that you are a person who tends to get upset and finally realize that you simply didn’t understand the other person well, turn your anger into curiosity. Inquire about the person's point of view and try to understand it more. Ask questions until you understand the way the other sees things. Once you do this, it will be easier to find a solution to the problem that suits both of you. This method is especially important when we get angry at our children, who even if they seem to be trying to annoy us deliberately, usually under their words and actions are hidden problems that we can solve if we only talk to them and try to understand them instead of succumbing to our nerves. Anger is often an emotion that hides our real feelings. The next time you feel that your anger is growing, look inside for what it is trying to hide deep within you. If you are able to uncover the hidden emotion, you’ll be able to deal with the real cause of your emotional response. Think about the last time someone cut you off on the road. At that moment, you must have experienced a fear that quickly turned into frustration and resentment.. Think about the time you missed a meeting or an event because of someone else who was holding you back. Under the anger you may feel disappointed with yourself for not planning your day better, someone else making you wait or you’re just afraid of the consequences of being late. Either way, anger is not the emotion in which you should invest all your energy to solve problems. Anger is a strong, powerful emotion that easily takes over any other emotion. When you learn how to "put a leash on it," you can get wonderful things through it. It can be used to fight injustice, strengthen self-confidence or improve concentration, but on the other hand, if you have no control over it, it can also destroy relationships and reputations and make us less loved. Anger conceals our true feelings behind a mask we wear, and a happy life can’t reach those who hide behind this mask. You'd better have the courage to face the world and your problems; Find out what really lies beneath the anger and root out the problem. The next time you feel anger starting to settle in your thoughts, you can hide behind it or face the problem it is trying to hide from you. Which do you choose?